The UConn Office of Environmental Policy performs an audit every year to determine our annual Greenhouse Gas Inventory. The data from this inventory is used in annual reporting for AASHE Stars Reporting, Sierra Club Cool Schools, and Second Nature President's Carbon Commitment. Consistent relamping replacements with LEDs in both exterior and interior lighting, for a fully LED campus by 2020. Long-term electricity purchasing agreement with ConEd for 100% of purchased electricity comprised of renewable energy (currently using wind power). Transportation light-duty fleet now includes 17 traditional hybrid vehicles, 12 plug-in hybrid vehicles, and 23 plug-in EVs. UConn is still on track to meet its 20% interim reduction goal by 2020. This is being achieved primarily through on-going LED re-lamping projects in buildings, parking lots, and walkways, and with the replacement of old, inefficient steam pipes. These projects are expected to be completed between 2015 and 2020 and will yield an annual 13,265 ton reduction in carbon dioxide emissions. 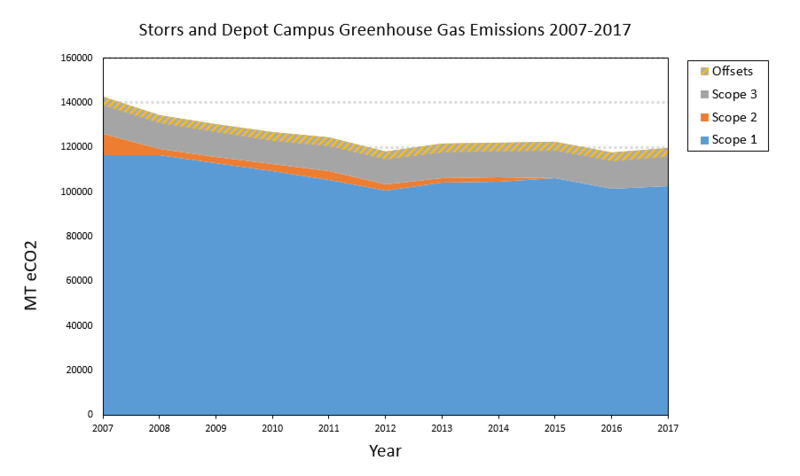 With all of these developments, UConn continues to strive toward carbon neutrality and a reduction of greenhouse gas emissions in the years to come. UConn’s Office of Environmental Policy uses the University of New Hampshire SIMAP Calculator to store and track greenhouse gas information. In addition, new building construction has accounted for a majority of Direct Source Emissions increase in recent years. In 2017, we added the Innovation Partnership Building (IPB) and the New Engineering Science Building (NESB), and removed the Connecticut Commons Residence Hall, which created a net increase of 72,827 sf on campus. 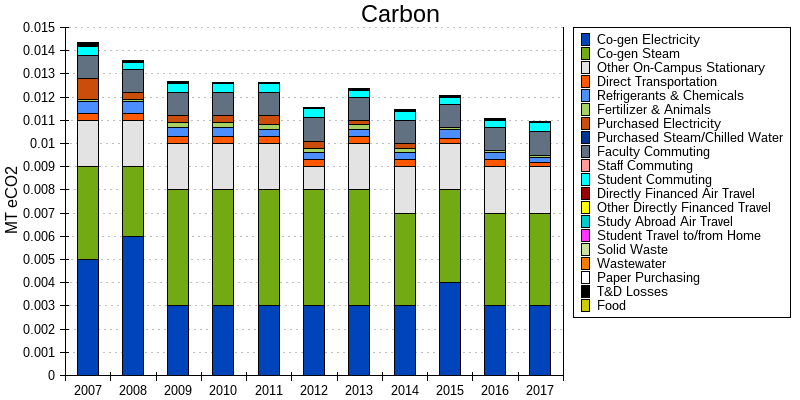 A breakdown of UConn's emission sources can be seen below. The left figure represents total greenhouse gas emissions, while the right figure represents greenhouse gas emissions normalized to our change in Gross Square Footage (GSF).